On Father’s Day 2008 my wife and I treated ourselves to a trip to Machias Seal Island in Maine (or Canada, as the boundary between Canada and the U.S. is still in dispute even at this late date). 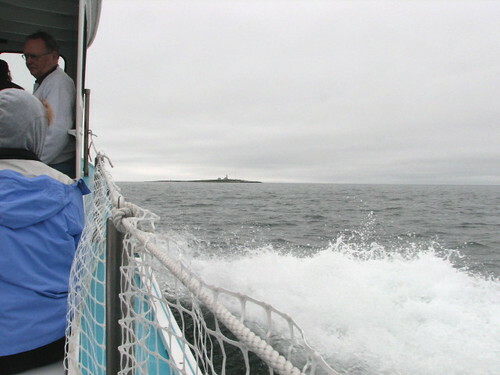 Cap’t Andy ferried about 17 of us to the island from Cutler, Maine, a fishing village about 10-miles away. As you can tell we were very fortunate that the ocean was almost as smooth as glass, That’s not always the case in the North Atlantic. Sometimes one is not able to land on the island because of rough seas. The island in the Bay of Fundy is only 20-acres in area and has the only manned Canadian lighthouse in the commonwealth in order to preserve Canadian sovereignty over the island. You can see from the photo that the island is treeless and pretty barren. 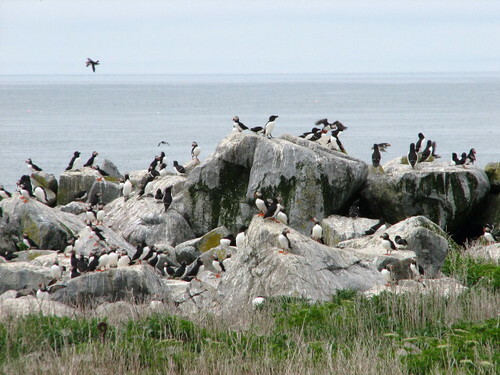 There are approximately 3000 nesting pairs of Atlantic Puffins and about half as many Razorbills on the island, using crevasses between these huge granite blocks as their nesting holes. There are a few Common Murres hanging out (no nesting in the past few years) and some Arctic Terns nesting in the grass on the interior. There are a number of blinds scattered along the periphery of the island. This one is used by researchers, but we were each escorted to others where we had the opportunity of seeing puffins and Razorbills from only five to ten feet away. This Atlantic Puffin was banded as part of an on-going research project. 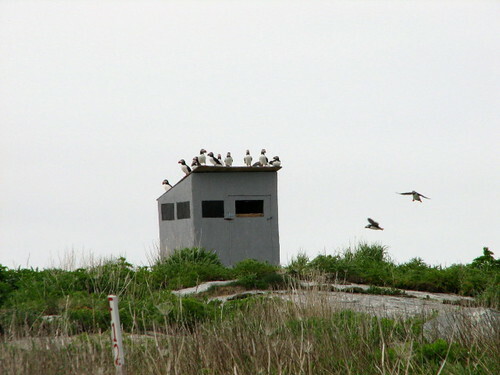 There are two resident lighthouse keepers, who rotate out every month for a month on the mainland and one or two researchers doing bird studies. One of the vocalizations of the Razorbills is the equivalent of an electric saw ripping through a board. For a while we thought there was some construction going on. 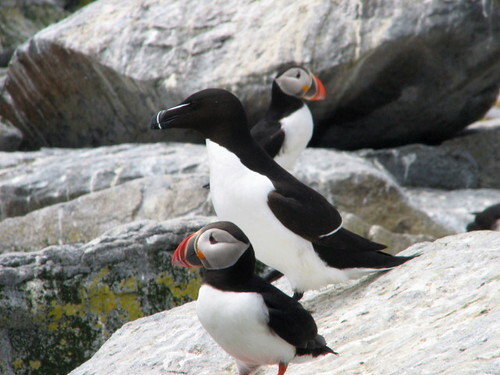 The vocalization of the Puffins is kind of a intermittent grunting sound. With so many birds, the area can be pretty noisy when they all are “discussing” things. You can see why the puffin was sometimes called the Sea Parrot or Sea Clown. It was really a marvelous experience to get so close to these interesting birds. This entry was posted on 4 August 2009 by mon@rch. 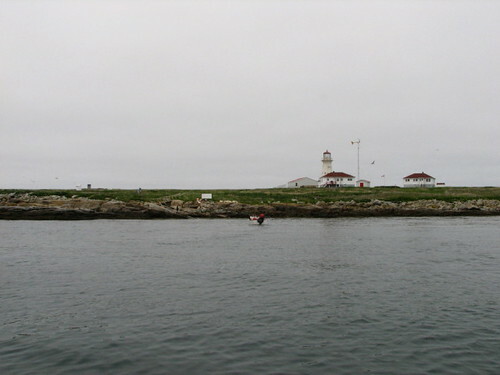 It was filed under Bird Banding, Birds, Nature, Ornithology, photography, Science and was tagged with Atlantic Puffin, Machias Seal Island. Those Puffins are on my life wish list. I was there years ago. It is good to hear that the Arctic Terns are still there. I thought I read someplace lately that they had stopped nesting there. Hopefully this was a mistake or that their numbers are down. I loved seeing the Puffins and Razorbills. I guess Barna is too old to get out on the rough seas now. I hope he is still living. Several years ago we did a two week loop through Maine: from Moosehead Lake, to Aroostook County, to Acadia, and Rachel Carson NWF. But the absolute best day was the day we took this trip. Puffins, Razorbills, and Murres everywhere. It was simply fabulous. Oh, that was a wonderful virtual tour for me. I feel like I have been there and it’s been thrilling! The photos are magnificent. Thanks for a wonderful trip! What a special trip! 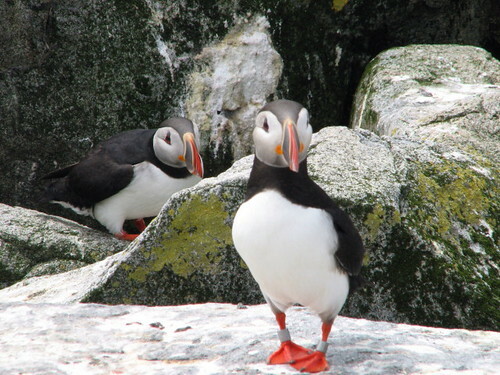 Very nice pictures of the puffins. Very interesting post. I have been to the Bay of Fundy twice, but when I was much younger and not interested much in birds. The Canadian sovereignity piece is intriguing too. When I saw the first photo, before reading the entry, I figured you were at a zoo somewhere! Wow! How very cool indeed that you got to see them and photograph them. Sounds like a wonderful trip. Ah, Tom finally publishes it. Nice to see the blog up and running again. We were there around the same time in 2008 and again this year. Captain Andy is great and getting on the island was a real treat! Nice photos. Wow! Amazing looking birds..they dont look real..great shot! Thank you for sharing the Puffins with us. 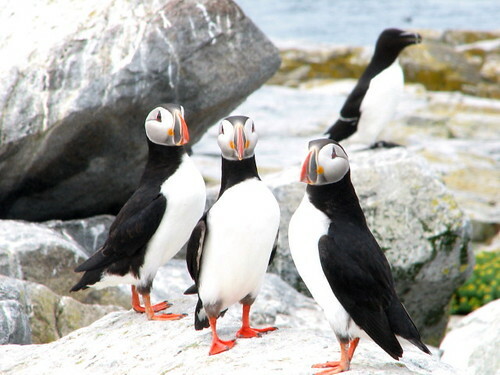 I want to see Atlantic Puffins for real. But I did see a mama bear and her two cubs in the forest at Quaker Lake yesterday! Phenomenal photos! Thanks for posting. Beautiful photo! They are an awesome creature! What is the other bird in the last image? That last photo with the Razorbill is my favourite! I love your Puffin pictures. They are cool looking birds. 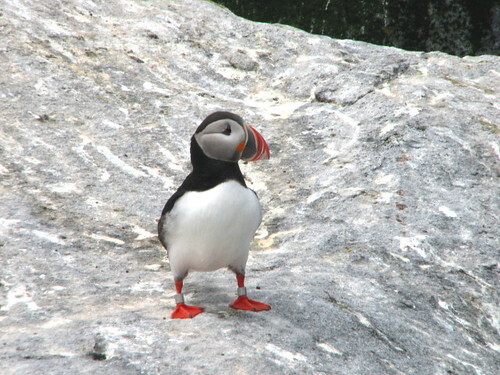 I’ve been to the Bay of Fundy years ago, I am sorry I missed the Puffins.